Beautiful panoramic sunset with pristine white sand. 03.LS.001 : Petitenget - 10,18 Are (1.018 sqm), Price: IDR 2,2 Billion/Are. 04.LS.004 : Surabrata - 66 Are (6.600 sqm), Price: IDR 250 Million/Are. 04.LS.006 : Tanah Lot - 21 Are (2.100 sqm), Price: IDR 1 Billion/Are. 04.LS.007 : Surabrata - 1,6 Hectare (16.000 sqm), Price: USD 2,3 Million/total land. 04.LS.009 : Bantas - 35 Are (3.500 sqm), Price: IDR 125 Million/Are. 04.LS.013 : Soka - 8 Are (800 sqm), Price: IDR 145 Million/Are. 04.LS.023 : Soka - 23,45 Are (2.345 sqm), Price: IDR 300 Million/Are. 10.LS.001 : Bukubani - 5,64 Hectare (56.400 sqm), Price: IDR 20 Million/Are. 10.LS.003 : Bukambero - 40 Are (4.000 sqm), Price: IDR 30 Million/Are. 10.LS.004 : Bukubani - 1,37 Hectare (13.794 sqm), Price: IDR 20 Million/Are. 10.LS.012 : Bukambero - 4,06 Hectare (40.690 sqm), Price: IDR 15 Million/Are. 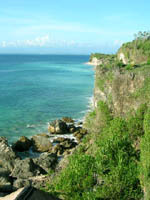 10.LS.013 : Watu Malando - 20 Hectare (200.000 sqm), Price: IDR 10 Million/Are. The Indonesian archipelago lies directly on the equator, just like a chain of some turtle shields rise from the sea. The fantastic nature and its complex variety of peoples is the one of the most fascinating richness of the earth. 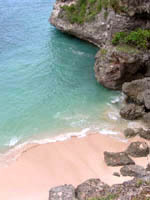 One of the small but perhaps the most famous island is Bali. Since it was discovered by Cornelius de Hotman, it has attracted the world's attention. Just south of the equator, Bali with its beautiful nature will always enchant the people around the world. A cluster of high volcanoes, their craters studded with serene lakes set in dark forests filled with screaming monkeys. The long green slopes of volcanoes, deeply furrowed by ravines washed out by rushing rivers full of rapids and waterfalls, drop steadily to the sea, that go to make a South Sea Island paradise. A tourist haven splendid beach, friendly people, a warm climate, a cool mountain air, a slow-paced Balinese Hinduism ceremony, Art and Culture, and many more that the people who ever been in Bali will always miss. Some of them even have a dream to live in this island. They try to make it real by invest some money in property; unfortunately it is not as easy as it looks like. Many rules should be faced that comes from the local or government. Here you need the staffs of BALI UTAMA PROPERTY to be your partner. Many people from all over the world have been looking to make smart investment on property in Bali as well as for their own retirement, such as private villas, land, resort, etc. Bali Utama Property will provide you with the best service in finding the property of your dream, land measurement, acquisition, applying all the documents needed to designing your future home in Bali. Bali Utama Property have many years of experience in property service since 1998, and with our commitment to satisfy our customer, we are sure that we could be the best choice of property company for all your needs of property in Bali. Since it was established in 1998, BALI UTAMA PROPERTY has helped many foreigners to own their private property in Bali. Unfortunately most of them do not understand the property rules in Bali. We, as a property agent, has made the property purchasing becomes easy for them. Mr. Hadi Utomo, the director of BALI UTAMA PROPERTY, is a man that masters this business very well since property is a main business for this company. He also understands very much the character of Balinese people and the government staffs also their products in property rule. Besides him there are some professional people that masters and have a full dedication to their own job; architect, contractor, villa manager, and web designer. All of them will provide you the best service in property needs. Therefore contact BALI UTAMA PROPERTY to get your private property in Bali.